Goat Street Cottage is owned by Helen and David Osman, who live in London. Helen grew up in the local area; the daughter of the local midwife and vet. 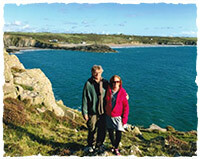 David has enjoyed visiting Pembrokeshire for the past forty years and both are avid coastal path walkers. Our favourite stretch of the Pembrokeshire coast path is from Caerfai Bay to Whitesands, around Ramsey Sound. We were delighted when the opportunity arose to buy the cottage in 2017, enabling us to spend more time in St Davids and share the cottage with family and friends, as well as paying guests. If you would like to join our mailing list for details of late availability discounts, what is going on in St Davids, please get in touch. Many of the photographs of St Davids on this website are taken by amateur photographers, uploaded onto Geograph.org.uk, to be shared.